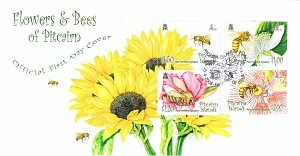 In May 1998 the UK Government aid agency, the Department for International Development, funded an apiculture programme for Pitcairn which included training for Pitcairn's bee keepers and a detailed analysis of Pitcairn bees and honey with particular regard to the presence or not of disease. 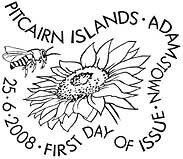 Pitcairn, it was discovered, has one of the best examples of disease-free bee populations anywhere in the world and the honey produced was and remains exceptionally high in quality. Pitcairn bees were also found to be a particularly placid variety and, within a short time, the keepers were able to work with them wearing minimal protection. As a result, Pitcairn began exporting honey products internationally. 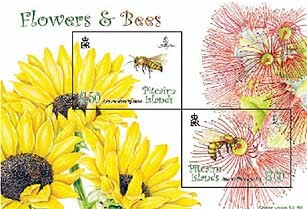 Pitcairn’s bees are the Italian honey bees, Apis mellifera ligustica which are the most widely distributed of all honey bees, and have proved adaptable to most climates from subtropical to cool temperate. While proven to be less satisfactory in humid tropical regions, the bees of the Pitcairn Islands are an exception and their establishment has been extremely successful. A.ligustica was introduced in 1978 and again in 1992, with the present population descended from both of these groups of bees. The bees exhibit brown and yellow bands on the abdomen and their body size is smaller and their overhairs shorter than those of the darker honeybee races. While A ligustica are susceptible to most diseases, such as parasitic varroa mite, the isolation that Pitcairn affords the bees is highly beneficial to the success of the breeding and honey programmes. The bees are prolific breeders and are excellent “housekeepers”, building quality combs. They are also good foragers and show lower swarming tendencies than other bee races. This variety was chosen for Pitcairn as the continuous nectar flow and favourable summer weather provide excellent conditions for the population to flourish. The bees are also gentle, which is a bonus for the hives and handlers alike. 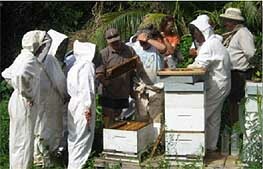 Apiarist James Driscoll from Hamilton, New Zealand, began beekeeping lessons in Adamstown in mid-2007. James’s overall goal is to increase honey production by 100%. He continues to assist the Pitcairn Islands and intends to achieve this goal, in partnership with local beekeepers, by education; hive management; colony manipulation and the raising of new queen bees. His focus is on the dynamics of building up a colony for honey production. He is also concentrating on the quality of the bees, and especially the queen bees, which could lead to fulfilling a future potential for export. $1.00 - Yellow Guava Psidium guajava This is a similar flower to Syzygium jambos, as seen in our previous Definitive issue. The P. guajava like Syzgium is highly desired by the bee population on the Island, with the Yellow Guava also having value as a food crop. $1.20 – Portulaca Portulaca oleracea This small ground cover succulent grows abundantly near the food gardens and its mass of little flowers is covered in bees most of the time. 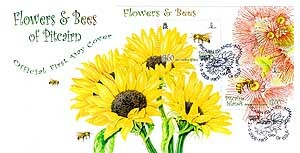 $1.50 Sunflowers These have been introduced to Pitcairn and several different varieties are grown especially to attract bees. The flowers make a dramatic sight when in bloom. $3.00 Mountain Chesnut Tree Metrosideros collina - Even though the highest point is only 320 m above sea level, these upper zones of Pitcairn are often cloud covered and host this tree. Known as Laata on the Island, this is a native to Pitcairn and is easily recognised by its abundance of lush, red flowers. 25 June 2008 for a period of 2 years.